What is the solution? How do we reverse this trend? It’s about making the time for your friends and as hard as it is to step away and disconnect from our schedules, it’s the best therapy we can invest in for ourselves. It’s what turned me to photography. I was so depressed watching the news and all the sadness night after night, I got myself off the couch and out of the house enjoying what mother nature can give us for free, a beautiful beach or sunset, time away. But I’ve decided to take it one step further. I have recruited three of my girlfriends and I’m taking them on a girl’s weekend away to re-establish our friendships and refresh ourselves. No modern technology. A complete digital detox! When I first decided to do this, the first hurdle was where? I wanted us to get right away from the Gold Coast, turn off the mobiles, leave the laptops behind and relax and unwind. Getting on a plane seemed too hard and too expensive. After some research, the perfect place for me was a trip down to Byron Bay. Under an hour’s drive from the Gold Coast, we could take a leisurely trip once the families were sorted and be there in time for a long lunch. 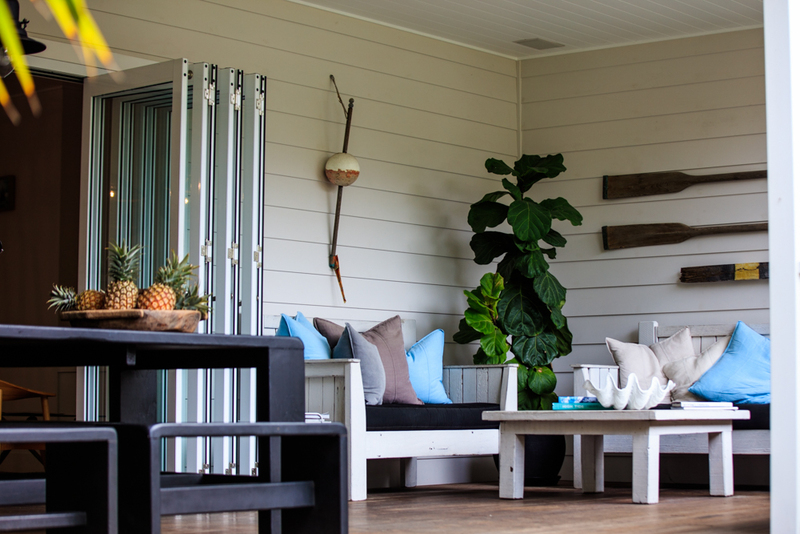 First stop was of course The Farm at Byron Bay. This was a no brainer. You can see why it is so popular with Gold Coasters to head down just for a Sunday lunch or a day trip. 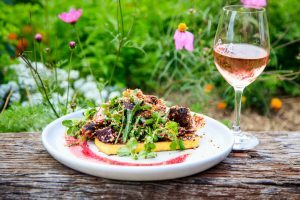 Just off the main highway, there is literally a farm set on 86 acres of land, including a rustic style farm produce restaurant, beautiful flower shop, fresh produce store and gourmet restaurant. 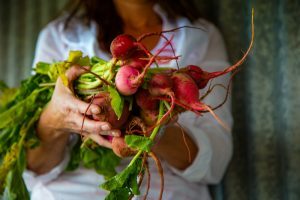 Owned by Tom and Emma Lane of the Oroton fashion empire, their motto is “Grow, Feed, Educate, Entertain” and they are all about various business working together to grow, produce and educate using sustainable methods. Farmer Travis took us on a tour around the farm and his enthusiasm was infectious. We learnt everything from the history of the farm to the individual personalities of the different pigs. Was actually really enjoyable and I would highly recommend taking a tour if you are in the area. At the end of the tour and after an early start, of course lunch at The Three Ducks, the restaurant at The Farm was a must. Serving fresh, seasonal produce, mostly sourced from the farm itself, the food was exceptional. Adam, our host gave us one of the best seats in the house, out on the veranda over looking the farm and the picturesque Mount Warning in the distance. We left the ordering in his capable hands and could not have been more delighted. With a vegetarian and a gluten free guest in our party, there were so many amazing options. A few must tries were the Byron Bay haloumi with farm seasonal vegetables (vibrant colors and beautiful flavors), the slow roasted, sticky spiced shoulder, (oh my gosh, all I can say is I’m so glad I’m not vegetarian) and the seaweed cured fish was so delicate I could have eaten plate after plate of this gorgeous dish. Finding somewhere to stay in Byron was a bit of a challenge for me. There are so many options, I wasn’t sure where to start. My requirements were somewhere close to town and close to the beach. I didn’t want to have to get the car out every 5 minutes to go anywhere. I’m not sure why I have never found this place before, but oh what a treasure it was to discover The Atlantic at Byron Bay. 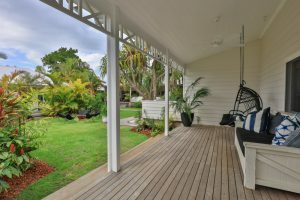 A series of guesthouses set amongst gorgeous palm tress and luscious landscaped gardens this is a tropical oasis just a short walk from the hustle and bustle of down town Byron. It’s hard to describe this place perfectly and do it justice. 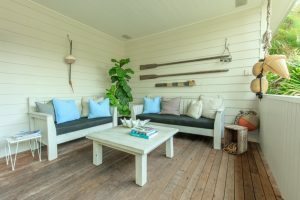 Fashioned by owner and interior designer Kimberly along with her husband Stephen, this place is full of eclectic styling which is a mixture of surf meets Byron gypsea style. No children under 10 years old permitted which lends itself to a quiet, relaxing holiday vibe around the many communal areas. We stayed in one of the beautiful modern guestrooms of the main house, but other options are cottages or even an airstream American caravan for something fun and different. The beauty of the Atlantic was its fabulous location but also being a “Guesthouse” we found that we spent a lot of time hanging out in one of the many lounge or kitchen areas, which was a great way to relax and meet with other guests. What to do in Byron is like asking how long is a piece of string. There are so many options and we were never short of something to keep us entertained. The main purpose of this trip was to reconnect with friends and wind down from life, so a stroll into town and around the many quirky, cute boutique shops filled our first few days nicely. 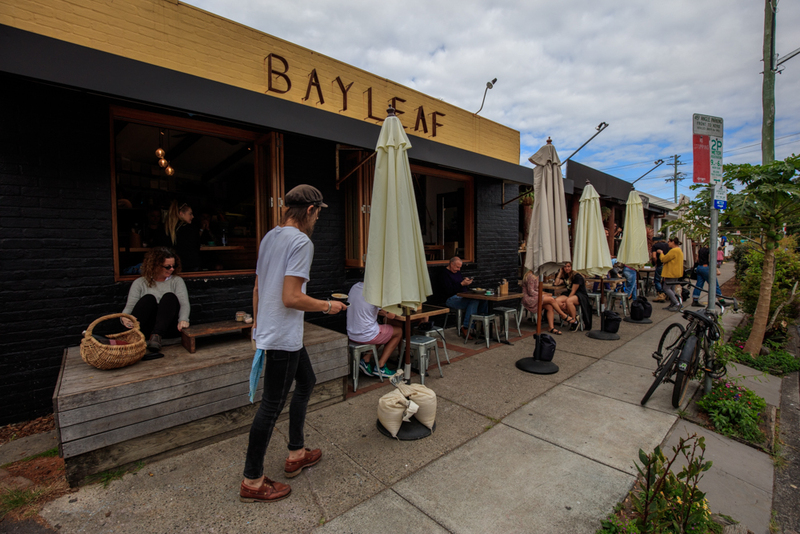 There are plenty of great places to eat, but one of our absolute favorites was Bay Leaf just a short walk from the Atlantic on Marvell Street. Boasting a “hip vibe and choice breakfast and lunch” we loved it so much, we ate there several times. Great, simple food, well priced with friendly service. 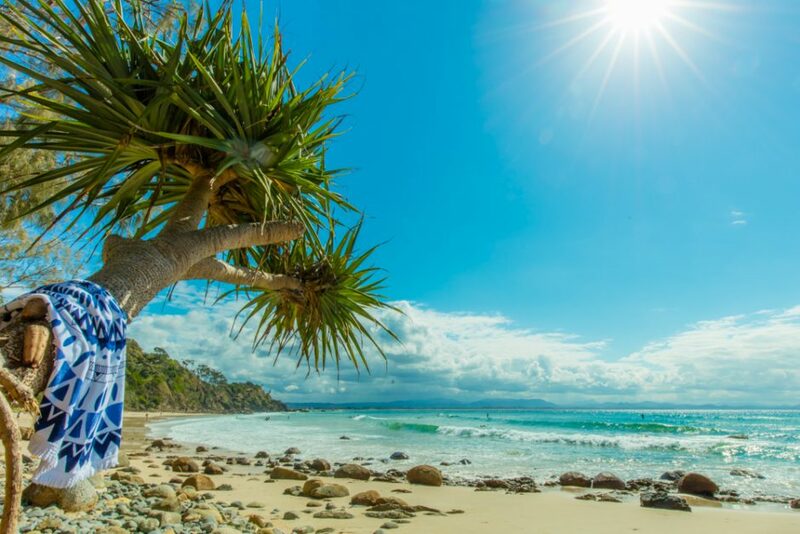 Of course if you visit Byron Bay, you are going to visit one of the many spectacular beaches. One of our favorites was Clarks beach, walking distance from The Atlantic. Endless white sands and crystal clear water we spent hours lazing on beach towels and enjoying the spring sunshine. We also loved The Pass, a great place to watch sunset and Wategos is a famous Byron beach and not too busy as parking is limited. You need to be reasonably fit to really enjoy this experience as you are obviously paddling through surf – even though fairly mild. We were all up for the challenge and keen to have some active fun. 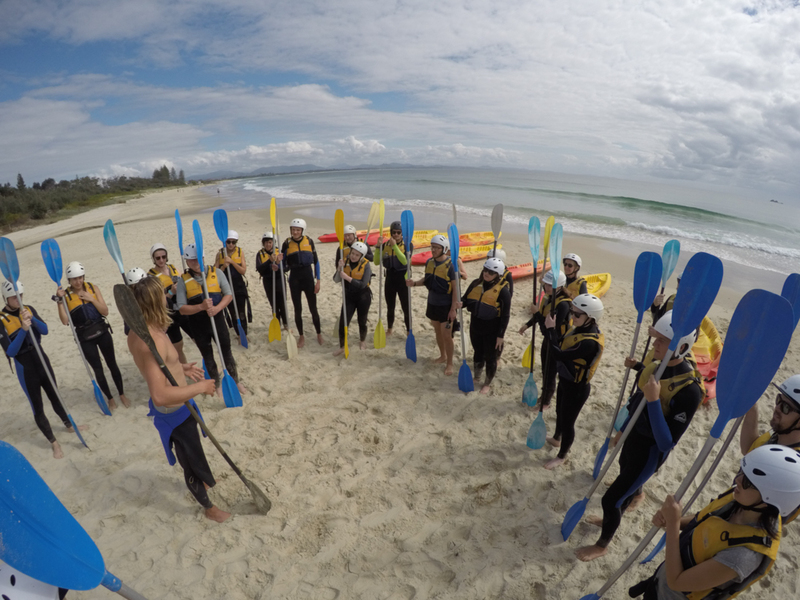 I asked around and pretty much everyone suggested “GoSea Kayak Byron Bay” for the experience. We were picked up from our hotel by Kurt, Byron local born and bred and also owner of the GoSea Kayak. Once we were all kitted up in wetsuits (optional but if you feel the cold it’s a good idea) life jackets and helmets, we had a quick briefing and hit the water. Within about 5 minutes of leaving the shore, we saw turtles and a pod of dolphins. The English tourists in our group carried on as if they had discovered the Lock Ness Monster. It was quite entertaining watching people who had never seen dolphins in the wild before. Makes you realise how lucky we really are seeing these majestic creatures regularly in the water. They came past us fairly closely so had everyone motivated to keep paddling out to deeper waters. We actually ventured a fair way off shore and saw loads of whales, dolphins and turtles. It was an incredible experience. These sorts of tours never promise wildlife encounters, obviously, but to have so many in a 2 hour paddle was such a bonus. In our group, we had 4 guides from GoSea, Brooksy, Doggie, Mercedes and Virginia. I need to mention them all as they were such great fun and made the experience even better. The local knowledge they shared along with the direction during the kayak tour was fantastic. 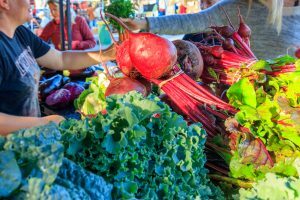 The other must do down in Byron is the farmers markets on Thursday mornings. This is one of the best fresh produce markets I have ever been to anywhere. I was literally skipping around the stores so excited by the amazing greens and vegetables all at really cheap prices. We picked up a bundle of salads, fresh baked breads and cakes and some cheeses to keep up fed for a few days. Was so nice throwing together a salad with a chilled champagne and relaxing around the fire pit at the Atlantic. Who needs expensive restaurants! I would almost go as far as to say it is worth the drive down from the Gold Coast every now and again for these markets, but quite a few of the operators also do to Palm Beach markets here on the Gold Coast on a Saturday so I will definitely be checking those out now. Anyone wanting a business idea should make up some hessian shopping bags and get down to the markets to sell them, would make a great souvenir to tourists and as no stall holders supplied bags, we were caught out carrying trip loads of groceries to the car. 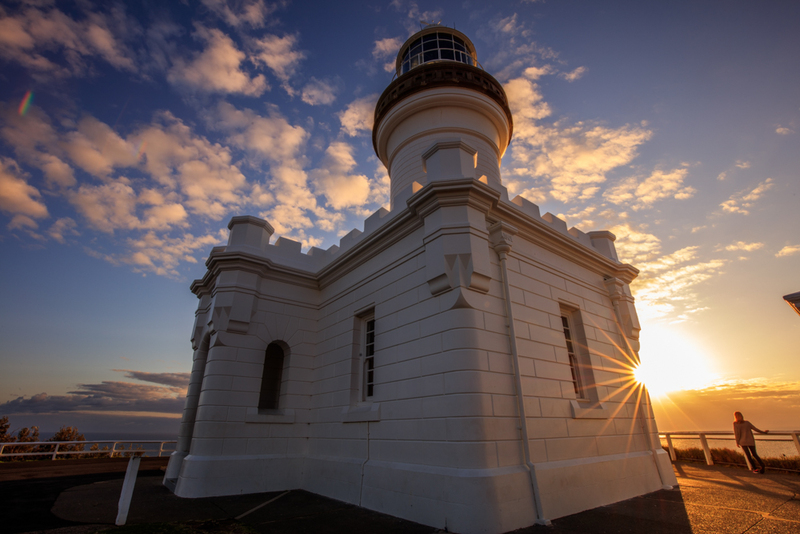 Byron Bay is clearly a beach oasis, but if you venture not too far inland there are many beautiful walks and places to explore as well. On our way back to the Gold Coast, we stopped at Killen Falls, which was about a 20 minute drive inland from Byron. The walk from the car park was only about 10 minutes, although it’s a fairly rugged track and lots of rocks once you get down near the water so I would suggest good walking shoes and probably best not to go after rain as the track would be really muddy and slippery. Well worth the short walk though, picturesque waterfall and you can even walk in behind the falls. To have a few days away from home, chores, work, family responsibilities felt like weeks and was the perfect medicine to recharge my long flattened batteries. I feel like in our rush to get everything done in life, we forget to take time to stop and feel the experience. We are so busy making sure we get that perfect selfie to share on Facebook so everyone can see what we are doing, eating, seeing, we forget to actually be in the moment ourselves. To put the phones away, leave the laptops at home and forget the world is the most refreshing experience. It took some organizing to get time away and I think the thought of the effort often puts people off getting out and doing the same, but even if it’s only for a night, to spend some time with girlfriends, talking about nothing, solving the problems of our own little worlds was worth more than the most expensive therapist money can buy. Don’t make excuses, make the effort, once a month once a semester, hell even once a year and you will come back a new person. I learnt the most valuable lesson whilst I was gone – that the world doesn’t fall apart without me, ok so maybe no cleaning or washing was done, and my family ate out every night, but not only did I spend time with my girlfriends, my husband had time to connect with our children. If you’re anything like me, as a mother, you tend to be the “go-to” for everything to do with your children from taxi driver to problem solver to listening ear and I have a husband spends a lot of time away travelling with his work so I’m often like a single mother. I love that he got the chance to have one on one time with our two little girls while I escaped with my girlfriends. There are so many reasons that a digital detox from our crazy world does wonders for your soul. My girlfriends and I are now planning our next escape. It’s something we have decided to do on a regular basis, not only for our own personal sanity, but to share our stories with others and inspire them to do the same. 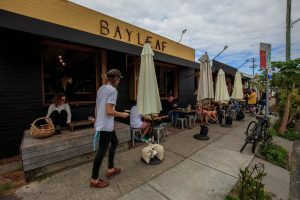 The above is an excerpt from a story I wrote for the Gold Coast Bulletin about Byron Bay. I have had a few people contact me asking for information about this story, so have attached the full article for your information.